Enjoy another issue of NetEqualizer News! This month, we preview our exciting Release 8.1 (Enhanced RTR), highlight one of our resellers in South Africa (Cybersmart), and show off our updated Libraries Guide. As always, feel free to pass this along to others who might be interested in NetEqualizer News. On Memorial Day (May 26th this year), 50,000 people descend upon Boulder, Colorado to run the BolderBoulder 10K race. Anyone can run the race, and some walk it as well. However, to get your best times (a PR, or “personal record”), I find that I need to develop a training plan and start training about two months before the race. This is always a big commitment for me mentally and physically, but I find it pays off in the end. This year I ran in 53 minutes, beating my goal time by 1 minute. As an engineer on our Dynamic Real-Time Reporting tool, I find that I use this same skill to plan & execute my development work. I am happy to say that our Release 8.1 (Enhanced RTR) is on track for a late summer/early fall roll-out. You will see some of the initial screenshots below. We are very excited with how it is turning out.We love it when we hear back from you – so if you have a story you would like to share with us of how we have helped you, let us know. Email me directly at zack@netequalizer.com. I would love to hear from you! We are very excited to announce Release 8.1 (Enhanced RTR) – coming in late summer/early fall of this year! 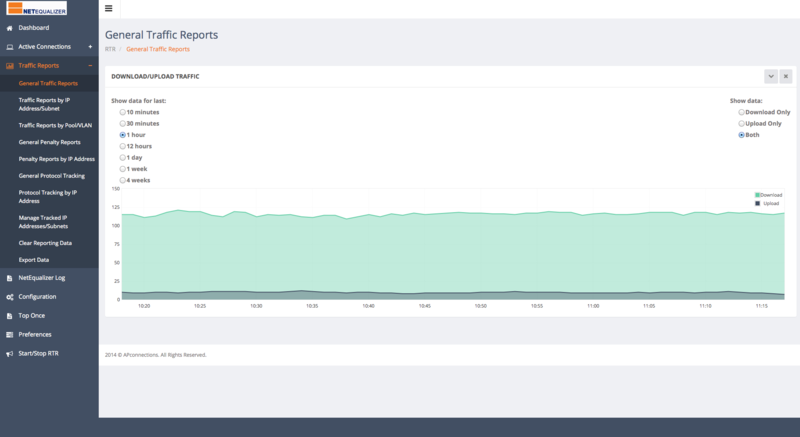 This release is special because it includes a new version of our popular Dynamic Real-Time Reporting (RTR) tool. The original RTR provided some basic functionality and served as a test to discover what our customers truly needed in a reporting feature. You gave us feedback, and we listened! 1) New and improved graphing: We’ve added things like timestamps to the graph’s x-axis, a smart down-sampler in order to quickly graph up to 4 weeks of data, and the ability to show both upload and download bandwidth usage on the same graph. 2) Improved menu design with new graphs: We’ve created a new user interface with more intuitive pages and the ability to graph more data. For example, with the new RTR tool, you can graph bandwidth usage for individual IP addresses, subnets, pools, and VLAN’s. 3) Penalty graphs over time: We have a new graph which shows the number of penalties over time – allowing you to correlate bandwidth trends with penalties. Over the next two months, we’ll be stress and load testing this tool to ensure seamless integration with your network and NetEqualizer. Stay tuned to NetEqualizer News for updates on this release! Once Release 8.1 reaches GA, these features will be free to customers with valid NetEqualizer Software and Support who are running version 7.5+. If you are not current with NSS, contact us today! Deep in the heart of Cape Town, South Africa resides the offices of Cybersmart – a company that supplies bandwidth circuits to cities and towns all over the country, ultimately serving tens of thousands of South African citizens. Some of these customers are wireless Internet service providers in remote regions, where bandwidth is still quite expensive. Several years ago, they deployed a NetEqualizer on one of their regional circuits, and at once became true believers in the elegance of the NetEqualizer philosophy and technology. Not only are they our customer, but they have also become our regional distributor in South Africa and neighboring countries – supporting and reselling equipment to regional ISPs and businesses. So, if you are ever in need of a bandwidth circuit, or a NetEqualizer in their region, please give them a call! In April 2012, Managing Director Laurie Fialkov of Cybersmart issued a press release about its new uncapped ADSL product, which relied on the NetEqualizer as a backbone of its offering. “…The solution which provides Cybersmart with what it needs is a product called NetEqualizer. We were so impressed that we asked for distribution rights for South Africa, which was granted to us,” said Fialkov. “The way this product works, is it keeps track of the top TCP connections on a network. The NetEqualizer rates the connections based on how long the connection has been alive and how fast it is going. It will then slow the ‘top’ connections down so they are not unfairly using the bandwidth,” explains Fialkov. This solution means that business applications which use encryption are not arbitrarily slowed down (as is the case with many shaping solutions). Fialkov added that the TCP rules will only be enforced during times when the network load is high. “If we are not under peak load then no connections are equalized at all,” said Fialkov. Fialkov explained that, to be competitive, all ISPs need to oversell bandwidth to end-users – also known as contending bandwidth. What this means is that a certain number of users need to share the same bandwidth. “We are planning on overselling our uncapped product at 15:1 to 20:1, which we believe is a lot better than the current products in the market,” said Fialkov. Fialkov then pointed out that automatic shaping via the NetEqualizer has ensured a good experience on uncapped accounts. Cybersmart continues to use their NetEqualizer today, and has sold units across South Africa since mid-2012, based on their success implementing the NetEqualizer in their own business. This month we have updated our Libraries Guide. 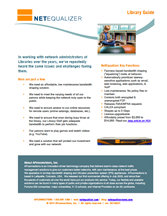 If you are a library and are considering a NetEqualizer, you may want to review our updated guide. This short guide is focused on issues specific to Libraries and explains how the NetEqualizer is used by our library customers to address these common issues. This is a quick way to learn about how the NetEqualizer might apply to your environment. And if you like real-life examples, you may also want to check out our Library Case Study with Washington County Cooperative Library Services. While the write-up is from 2012, the case study is still relevant today. If you are a current library customer, this guide and case study are a great read to optimize your NetEqualizer configuration. Take a look to see if there are features that you might not be using and want to take advantage of in your NetEqualizer installation. We would be happy to help you with your configuration. If you are current on NSS, contact support@apconnections.net to get help optimizing your NetEqualizer. Is Your Bandwidth Controller Obsolete Technology? Although not free yet, bandwidth contracts have been dropping in cost faster than a bad stock during a recession. With cheaper bandwidth costs, the question often arises on whether or not an enterprise can do without their trusty bandwidth controller. Mountain trails are usually not the first thing to come to mind when one thinks about Las Vegas. Though the area is primarily known for gambling and world-class restaurants (among other things), the mountains surrounding the city offer an excellent escape from the concrete jungle and lights. 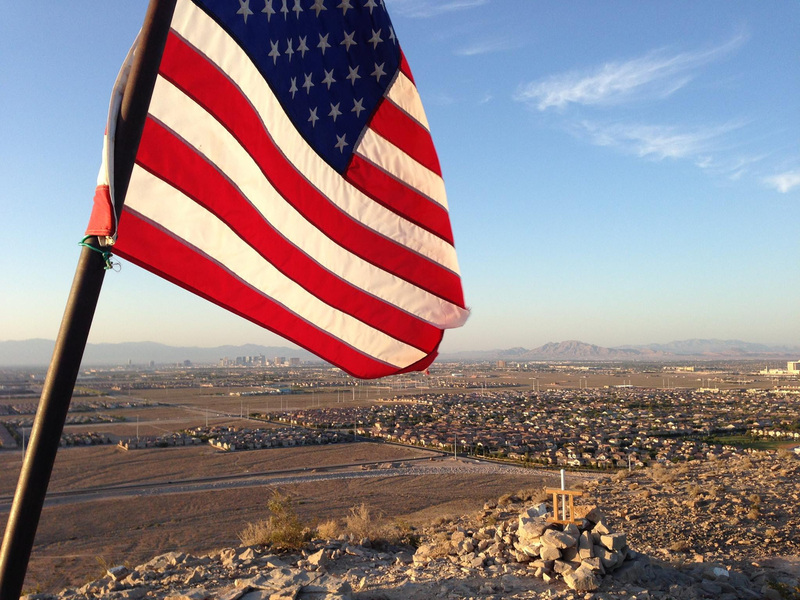 This picture was recently taken on the summit of one of the small hills surrounding the Southern Highlands neighborhood south of The Strip. It was unclear why the flag exists on top. « Is Your Bandwidth Controller Obsolete Technology?